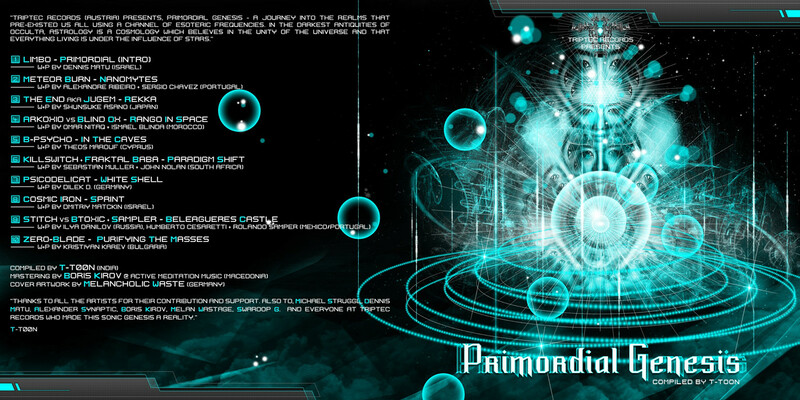 Triptec Records (Austria) presents, Primordial Genesis - a journey into the realms that pre-existed us all using a channel of esoteric frequencies. In the darkest antiquities of occulta, astrology is a cosmology which believes in the unity of the universe and that everything living is under the influence of stars. The seeds of gnosticism, shamanism, magic, myth, tantrism, and, spiritualism are rooted ever since and provide us with a quest for the secrets of faith. This album contains 11 full-length tracks,crafted by a blend of artists to recreate the energy through sounds that re-affirm the fact that the inward seeds of primordial existence are the keys to unlock ourselves from the world and preserve the faith to believe. So, be ready for this genesis !!! "Thanks to all the artists for their contribution and support. Also to, Michael Struggl, Dennis Matu, Alexander Synaptic, Boris Kirov, Melancholic Waste, Swaroop .G., and everyone at Triptec Records who made this sonic genesis a reality"
Last edited by T-T00N on Mon Jul 02, 2012 5:49 pm, edited 18 times in total. Congrats! Great line up, full support! artwork n masterin in progress !! more infos n tracklist update asa they take place ! a few more changes in playlist is due... may add some artists.. updates ll follow ! regards n full respect 2 u 4om Triptec crew ! looks power packed...and album cover is awesome ..good luck guys...waiting for this one..
imfreak wrote: looks power packed...and album cover is awesome ..good luck guys...waiting for this one..